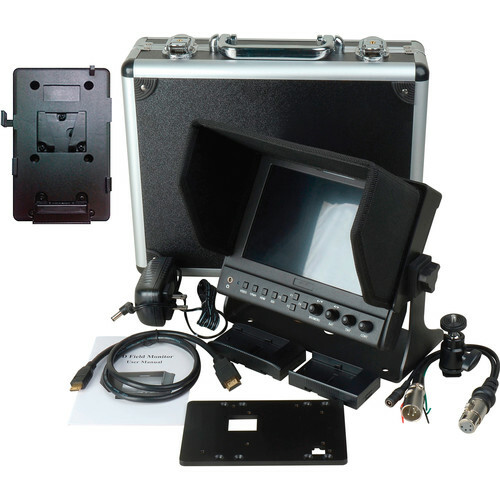 The DELV-WFORM-7-VM 7" Camera-Top Monitor Bundle from Delvcam comes with a DELV-WFORM-7 monitor and a V-Mount Battery Plate. The DELV-BPVM V-Mount Battery Plate allows you to mount a V-Mount battery onto your DELV-WFORM-7 camera-top monitor.. The DELV-BPVM V-Mount Battery Plate from Delvcam allows you to mount an Anton Bauer battery onto your DELV-WFORM-7, DELV-WFORM-7SDI, DELV-SDI-10, DELV-SDI-7, or DELV-HDSD-10 camera-top monitor. Box Dimensions (LxWxH) 5.6 x 3.6 x 0.9"